Nearly three years after the financial crisis that sent the nation’s economy into a tailspin, the public expresses mixed views of Wall Street. Nearly half of Americans (47%) say that Wall Street hurts the U.S. economy more than it helps, while 38% say it helps more than hurts; 15% offer no opinion. These findings, from Pew Research’s new Political Typology survey, are consistent with past surveys showing public ambivalence about Wall Street. In April 2009, shortly after the financial meltdown, a large majority (63%) said that Wall Street made an important contribution to the economy, but about as many (67%) said that Wall Street cared only about making money for itself. The Political Typology shows that views of Wall Street do not divide cleanly along partisan and ideological lines. Staunch Conservatives are strongly anti-government and pro-business; a large majority (72%) agrees with the Tea Party. Yet Staunch Conservatives express only modest support for Wall Street: 48% say it helps the economy more than hurts it, 39% say it hurts more than helps. (For detailed descriptions of all typology groups, see “Typology Group Profiles”). The most positive opinions about Wall Street’s impact are seen among two groups in the middle of the typology. 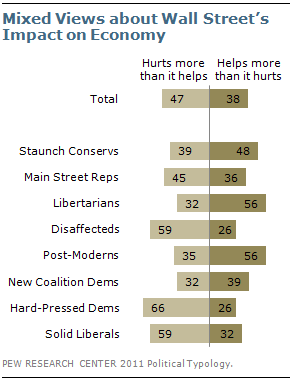 Majorities of Libertarians and Post-Moderns (56% each) say Wall Street helps the economy more than it hurts it. While Libertarians lean to the Republican Party, and Post-Moderns lean Democratic, both groups are well-educated and affluent. In this regard, two of the most financially stressed groups in the typology – Hard-Pressed Democrats and Disaffecteds, Republican-leaning independents – are highly critical of Wall Street’s impact on the economy. Majorities of both groups say that Wall Street does more to hurt the economy (66% of Hard-Pressed Democrats, 59% of Disaffecteds). Yet New Coalition Democrats, who also have relatively low family incomes but are financially optimistic, are divided: 39% say Wall Street helps the economy more than it hurts it, while 32% say it does more to hurt the economy. Solid Liberals, who are strongly pro-government and critical of business, express negative views of Wall Street. About six-in-ten (59%) say that Wall Street does more to hurt the economy, while 32% say it helps the economy more than hurts it. Many of the typology groups express very different opinions about business than they do about Wall Street. On the question of business profits, 54% of the public says that businesses make too much profit, while 39% say that most corporations make a fair and reasonable profit. Staunch Conservatives, who express mixed views of Wall Street, overwhelmingly see corporate profits as reasonable (by 78% to 13%). But Main Street Republicans are highly critical of corporate profits; 58% say businesses make too much profit, while only about a third (34%) say most corporations make a fair profit. The predominant view among Libertarians, like Staunch Conservatives, is that business profits are fair and reasonable (83%). But Post-Moderns, who express positive views of Wall Street, are more skeptical about corporate profits; a narrow majority (52%) says that profits are excessive while 41% see them as fair and reasonable. Just as New Coalition Democrats are less negative about Wall Street than are other financially stressed groups, so too are they less critical of corporate profits. Fewer than four-in-ten (38%) say that businesses make too much profit, only about half the percentages of Hard-Pressed Democrats (79%) and Disaffecteds (73%) who say this. 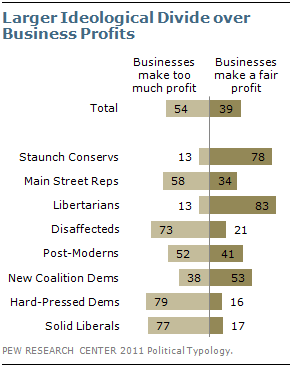 Solid Liberals, who are critical of Wall Street’s impact, are even more critical of business profits. As is the case with many issues, Solid Liberals’ views of business profits are diametrically opposed to Staunch Conservatives’ – 77% say corporate profits are excessive while just 17% say most businesses make a fair profit.